If you’re installing a new setup for a gas dryer, here’s a handy reference of the basic requirements so that the dryer will work right and your house won’t go boom and your pants go brown. 	Use a new CSA International-approved gas supply line. 	Install a shut-off valve. Securely tighten all gas connections. 	If connected to LP, use a manometer to measure the gas pressure to make sure it does not exceed 13 ̋ (33 cm) water column. 	1/2 ̋ IPS pipe is recommended. 	3/8 ̋ approved aluminum or copper tubing is acceptable for lengths under 20 ft (6.1 m) if local codes and gas supplier permit. 	Must include 1/8 ̋ NPT minimum plugged tapping accessible for test gauge connection, immediately upstream of the gas connection to the dryer (see illustration). 	If you are using Natural gas, do not use copper tubing. 	3/8 ̋ flare x 3/8 ̋ NPT adapter fitting between dryer pipe and 3/8 ̋ approved tubing. 	Lengths over 20 ft (6.1 m) should use larger tubing and a different size adapter fitting. 	If your dryer has been converted to use LP gas, 3/8 ̋ LP compatible copper tubing can be used. If the total length of the supply line is more than 20 ft (6.1 m), use larger pipe. NOTE: Pipe-joint compounds that resist the action of LP gas must be used. Do not use TEFLON tape. An individual manual shutoff valve must be installed within six (6) feet (1.8 m) of the dryer in accordance with the National Fuel Gas Code, ANSI Z223.1. An individual manual shutoff valve must be installed in accordance with the B149.1, Natural Gas and Propane Installation Code. It is recommended that an individual manual shutoff valve be installed within six (6) feet (1.8 m) of the dryer. The location of the shut off valve should be easy to reach for opening and closing. 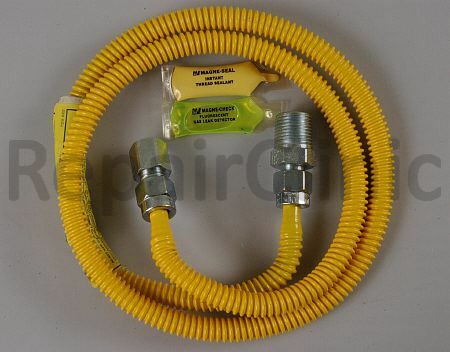 	Use an elbow and a 3/8 ̋ flare x 3/8 ̋ NPT adapter fitting between the flexible gas connector and the dryer gas pipe, as needed to avoid kinking. 	Use only pipe-joint compound . Do not use TEFLON tape because the white stuff that’s commonly available is too thin to make a good, reliable seal. This flexible gas connector kit includes everything you need to connect your dryer to your gas shutoff valve, including 4 feet of 3/8-inch outside diameter coated stainless steel gas connector with two fittings, leak detector solution and pipe sealant compound. Procoat polymer coating resists corrosion caused by bleach, ammonia and acids found in many home care products. 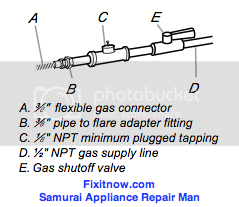 This entry was posted in Dryer Repair on August 22, 2010 by Samurai Appliance Repair Man.